Snap Inc, the maiden company of Snapchat, as it is now called, is settings its first footstep in the world of hardware. 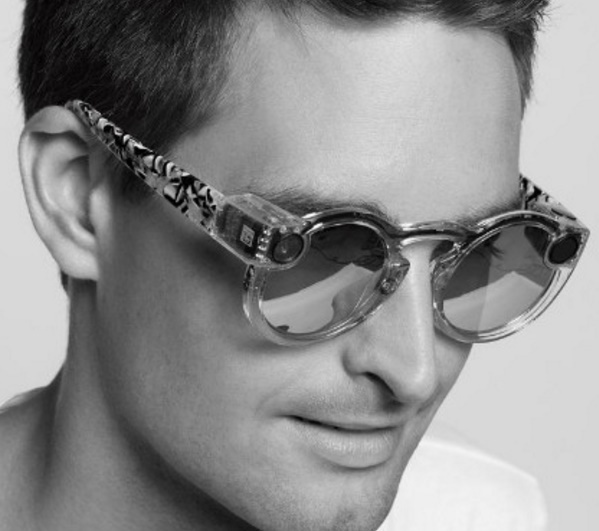 Snap Inc comes up with its first gadget called Spectacles. Spectacles are not like just another spectacles. The eye wear when worn around, let users record 10 seconds video clips with the click of a button. The button is located near the temples. Each time you tap on it, the button is activated and a 10 second video is recorded. Each tap of a button initiates a new recording from your first-person vantage..
What makes Spectacles a unique device is its ability to record circular video. Circular video gives the perception of human visions. Spiegel (as the company was called before) argues that rectangular videos are an unnecessary vestige of printing photos on sheets of paper. Spectacles’ camera uses a 115-degree-angle lens, which is wider than a smartphone camera lens and tries to deploy FOV, much closer to the eyes’ natural field of view. Another great thing is that yours hands are free while capturing the video. So capture the best moments of your life with Snapchat Spectacles. The device ranges from $129.99 and will roll out sometime during fall of this year.